In 21st century, “Capital” requires a more comprehensive and applicable definition than merely a social process where money makes more money through production relations. Capital, in its material manifestation, is a socially organized ‘process’, through which surplus value is produced and controlled by ‘unsustainable’ and ‘un-sovereign’ ways of exploiting labour (both manual and intellectual), land (and other commons), nature (non-renewable sources of energy and the earth’s bio-capacity including the climate). It is, however, important to equally emphasize, and theorize how Capital can also immaterially but objectively colonize and depoliticize societal/communal solidarities (from the level of household, to the level of world community).Thus, a critical analysis of Capital/ist relations requires the theorization of not only the exploitation of labour, land and nature, but also the systemic colonization of communal solidarities as non-material Commons, through the de-democratization of collective production and reproduction relations. Austerity regimes, for instance, are not only about protecting the corporate interest, e.g. by dispossessing social welfare, but also about an antagonistic relation towards democratic self-management, collaborative determination, and self-sufficient uses of resources. The colonization of social solidarities by Capital creates a fertile breeding ground for the resurgence of ethno-populist responses. 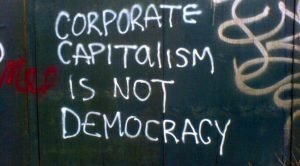 We will argue here that the profound democratization of economic relations can liberate the transformative movements from the immense gravity of Capital by overcoming the dilemma of surviving while transforming ubiquitous capitalist relations.